The disuniting of America : reflections on a multicultural society · One Book. One Author. One Hour. Notes on front endpapers: Historian's goal (51) accuracy, analysis, objectivity. History is a weapon (57) Russians, Japanese party-line history. Xenia, Ohio--where my father grew-up. Louis Brandeis--Danger of Speech p 154. “Hate speech “ (156). Baker's Dozen. U.S. has worked thus far. (15) Why is Canada ripe for schism. America has been a racist nation (18). Multiculturalism, political correctness, Eurocentric 22 voguish blather. Great Britain--7 points American emanates from G.B.--34. Where did melting Pot originate? (Israel Zangwell) What is cultural pluralism--42--would lead to Balkinization of America. What immigration act of 1924. What's New York curriculum (history) What's African American Baseline Essays. U. of Penn--Black's own yearbook. 1900--U.S. most literate nation--now were 45th (115). Smith College (120) lists types of oppression. Gunnar Myrdal of Sweden--What is the American creed. Lamb tallys the Books by Arthur M. Schlesinger, Jr. (14). Notes/underlinings: Notes: “world without frontiers,” “John Stuart Mill,” “Tribalism,” “Canada,” “Americans are racist,” “WWI, WWII,” “a nation of groups not individuals,” “own system of education,” “intermarriage,” “America confronts racism,” “Herman Melville,” “Emerson “new race,” “Geo. Wash.,” “democracy. self-gov.,” “Declaration of Independence, Constitution,” “another great commentator,” “James Bryce,” Gunnar Myrdal 1944, the creed,” “Great Britain: 1. its laws; 2. institutions; 3. political ideas; 4. literature; 5. customs; 6. precepts; 7. prayers,” “WASP,” “Germans, Scandinavians, Irish,” “WEB Du Bois,” “Lincoln, Know nothings,” “27 million new Americans 1865-1914,” “Henry James,” “1908 play Melting Pot,” “submerge ethnic identities,” “rise of Americanization,” “cannot think of yourself in groups,” “TR,” “Horace Kallen,” “cultural pluralism,” “Balkanization of these United States,” “Immigration Act of 1934,” “FDR,” “Tocqueville racial flaw,” “”racist exclusion deeply ingrained,” “1. Indians seized lands; 2. Africans on plantations; 3. Chinese railroads,” “women, Jews,” “Ethnic,” “History's pureness,” “Plato's noble lie,” “Nationalism,” “Napoleon,” “Gorbachev,” “party-line history,” “Japan benevolent image in its schools,” “Czechs,” “Andrew Hacker,” “Peggy Noonan,” “Allan Bloom,” “Paul Johnson,” “1960 integration accepted,” “white historians,” “movie Glory,” “Blacks and the American Dream,” “black at the bottom,” “Crispus Attucks,” “public school system,” “blacks, high energy interrupting, loud talking,” “reconstruction of American history,” “Eric Foner, Christopher Lasch,” “Asa Hilliard,” “Edward Said,” “doctrinaire ethnicity,” “S. worried about ethnicity, Afrocentricism,” “taught black history,” “the issue bad history,” “Baseline--half truths,” “West African emperors,” “Diane Ravitch,” “Charles Drew, blood plasma,” “names, 1962 Le Roi Jones,” “the bad things,” “Orlando Patterson,” “John Hope Franklin,” “Ravitch,” “Villans are white males,” “New York history curriculum,” “Gore Vidal,” “ethnicity rage,” “Penn Black yearbook,” “the consanguinity principle,” “Kenneth Clark,” “Bilingualism,” “elitist concern,” “Mario Cuomo,” “Shakespeare and English 1 Billion,” “U.S. 45th most literate,” “Free Speech,” “Smith College,” “P.C.,” “Diane Ravitch,” “Penn. racist,” “Foreign born 10%,” “basis of admission,” “dead white male,” “80% of U.S. European,” “78% of college students don't have to take European History,” “deconstructionists, poststructurists,” “Edward Gibbons,” “the West and self-criticism,” “European ideas,” “Salman Rushdie,” “Africa today,” “black elected officials,” “multiculturalism: 1. an ideology; 2. a mystique,” “militant,” “grand theme of American History,” “Identity politics,” “right and left,” “Todd Gitlin,” “Bill of Rights in peril,” “censorship,” “Louis Brandeis, 'danger of speech,'” “'thought we hate' under attack,” “Justice Jackson,” “Skip Gates,” “hate speech is new,” “expression is overprotected,” “emotions,” “Germany and neo-Nazis,” “bans words that hurt feelings,” “Gates 'voodoo methodology',” “hurt-feelings standard,” “physical assault,” “* unregulated marketplace,” “minorities gain most from 1st amendment,” “right and left political correctness,” “my father. . .'truthful picture of the past',” “Henry Adams most brilliant.” Underlinings: Race, ethnicity, nationality, melting pot, Americanism, stereotypes, xenophobia, nationalism, myths, education, common ideals. 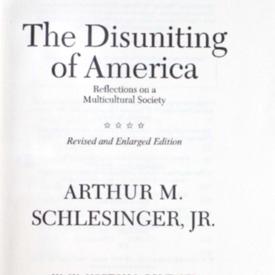 Schlesinger, Arthur M, “The disuniting of America : reflections on a multicultural society,” One Book. One Author. One Hour., accessed April 19, 2019, http://booknotes.gmu.edu/items/show/478.